No this is not an x-rated post...lol. My fluffball Dexter loves to get in the shower and I thought I would snap a shot of him (with out me...yikes the thought!) sitting on my bath seat. He is so funny, always comes running when he hears the water come on. 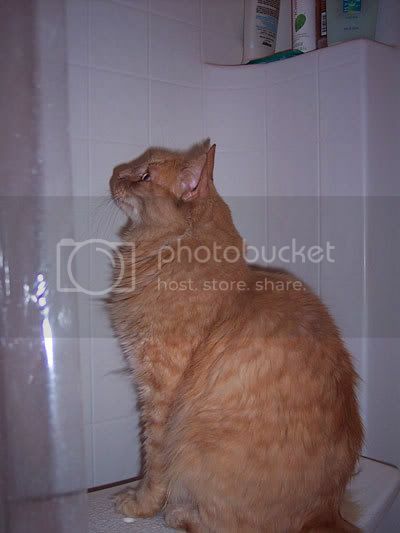 Not sure exactly why, I thought cats HATE water! Not that he enjoys being drenched, but he doesn't mind a little spritzing on his face. He likes licking the water off the shower floor and the seat, and my leg when I'm in the shower. Gosh I hope my cat's not a perv. LOL! Dexter is a doll...and a pervert...lol.I have a Jiffy (the peanut butter color) that likes to sit in middle of bathroom floor...we don't know why.